During the course of my summer travels for PRA, I always attempt to take in as many Major League Baseball games as my schedule will allow. In a six-week period so far this summer, I have had the chance to watch games in Baltimore, Maryland; Washington, D.C.; Minneapolis, Minnesota; and Seattle, Washington. I had the opportunity to watch games at Target Field in Minneapolis and Safeco Park in Seattle within four days of each other. These are experiences that I just would not be able to do on my own and is an added perk to working and traveling for PRA. 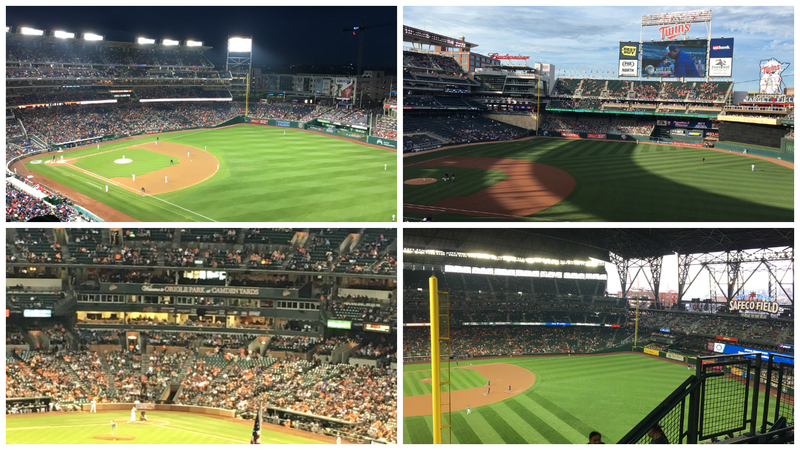 (clockwise) Baseball Games at Nationals Park (Washington, D.C.), Target Field (Minnesota), Oriole Park at Camden Yards (Maryland), and Safeco Field (Washington). capacity. If you go to a Major League Baseball game, you will notice that almost every player has “walk up music” with a specific song played as he makes his way from the on-deck circle to the batter’s box. Many of us at PRA have started the fun activity of identifying what we would want our “walk up song” to be if we were playing in the major leagues. Great Blog. A question. Why do people sing “Take Me Out to the Ballgame” when they’re already there?